I definitely have an on-again, off-again relationship with Pottery Barn. During the last 3 years it has spent the majority in the off-again, but in the last 6 months they've really stepped it up. When I saw these chairs I was sold! 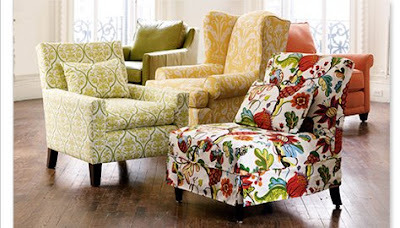 I love them all but especially the yellow one, I have been daydreaming all day about where it could fit in our house. I've come up with a few ideas and now I just have to work on the husband. I am going to have to check them out again then because I remember loving them for a long time but have not seen anything that great for awhile, I totally agree with you. :: i totally agree. It was a little too country, and not enough contemporary for my likes during the last decade. BUT! I noticed 2 or 3 couches they have recently released that are unlike anything you can find anywhere else for that price. Yay for PB! Hey, don't you think it would be weird when people saw that chair in my house first, and then you got it?